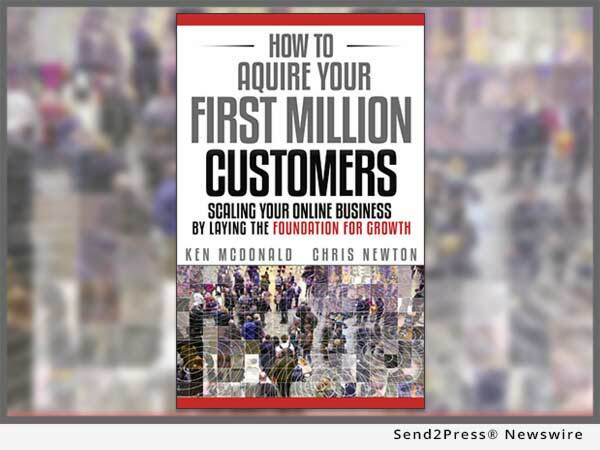 Digital marketing veterans Ken McDonald and Chris Newton have written and published “How to Acquire Your First Million Customers,” a book about growing online businesses through a variety of customer acquisition and online marketing techniques. Ken and Chris are no strangers to growing online businesses. Years ago, they worked together at a photo industry startup company, growing the user base from a few thousand customers to over 12 million. Ken has seen similar successes at other online businesses, including at TeamSnap where he is currently Chief Growth Officer. Chris has helped lead dramatic digital revenue growth at large hospitality companies in recent years, including Hilton and Marriott International. “How to Acquire Your First Million Customers” begins by explaining (in layman’s terms) how to set a business up for success, and how to define and measure growth. It then explores a variety of tactics and channels used for driving customer growth: marketing strategy, digital marketing, social media marketing, SEO, PPC, online partnerships, video and content strategies, influencer marketing, paid advertising, AB testing, offline marketing, and more. The back half of the book explains how to retain new customers, and how to scale a business for growth. The book also references several common tools that many businesses will find helpful, including Facebook, Google Analytics, YouTube, Hootsuite, Moz, Crazy Egg, MouseStats, Optimizely, Buzzsumo, Mattermark, Alexa, Radian 6, Commission Junction, Share a Sale, AWIN, and others. Download How to “Acquire Your First Million Customers” on Amazon: https://www.amazon.com/dp/B06Y3ZLKQ3/. Ken has been involved with customer growth for the better part of 25 years. For example, starting in 1998, he was a leader on Oracle’s e-commerce team. There he helped grow Oracle’s e-commerce business from a relatively small site to one that was doing hundreds of millions of dollars a year in business. At the time, it was one of the largest e-commerce sites on the web. Later Ken joined LifePics, an online photo company, where he ran everything from marketing to product management to account management. While Ken was there, he grew LifePics from a few thousand users to a user base of over 12 million. After LifePics, Ken joined TeamSnap as Chief Growth Officer. At TeamSnap he runs growth marketing, sales, analytics, and ad sales. During his tenure at TeamSnap, he has used cutting-edge analytics to grow TeamSnap from half a million users to 15 million users. He also drove the B2B side of TeamSnap’s business from a handful of users to roughly 3,000 customers. Chris has been a thought leader and innovator in the digital marketing space since the early 2000s. He wrote and published two books on Microsoft Project and Microsoft Project Server while working for QuantumPM. Shortly after, Ken McDonald hired Chris to come work at LifePics. Under Ken’s leadership, Chris learned the ins and outs of digital marketing, serving as Director of Online Marketing for the company during the final years of his tenure. More recently, Chris has led marketing and e-commerce efforts working for both Hilton and Marriott International, overseeing a portfolio of high-profile hotels and resorts, and managing multi-million dollar marketing budgets in major markets such as San Francisco, Denver, New York City, Chicago, and Hawaii. For more information, visit http://www.FirstMillionCustomers.com/.